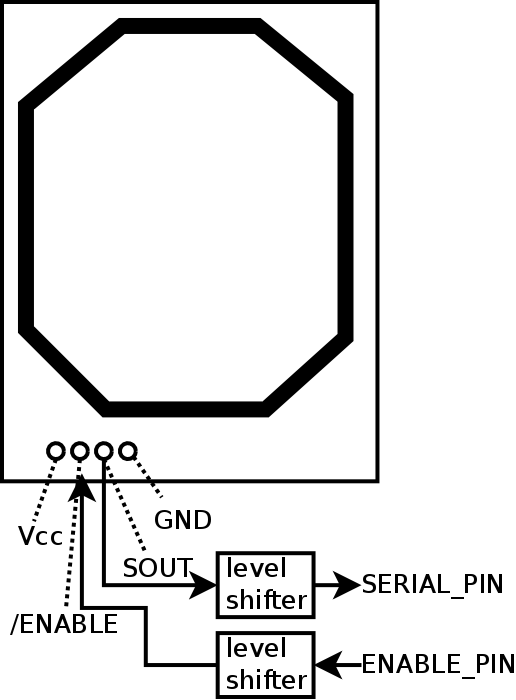 VCC for the reader is 5V, so level shifting is needed for the Raspberry Pi. Because the reader uses a baud rate of only 2400bps, a bit-banged solution is possible and leaves the Raspberry Pi serial port untouched. Any GPIO pins can be used. I used GPIO5 for /ENABLE and GPIO27 for SOUT. The reader can send repetitions of the code for one swipe of a tag; it seems to be pretty random. Quantities ending in _US are in microseconds. In this application, where there are big gaps in activity on the serial line when tags are not being read, it works fine. If there were more continuous activity timing could be a problem. This could probably be adapted for slightly higher baud rates, (e.g. 4800 and maybe 9600), but probably not much higher.